This weekend workshop combines visual art, awareness practice and body-based exercises to explore important themes in our lives. Participants will come away with a set of creative and reflective tools that bring head, hands, heart and gut into play. Together we will use art to explore the parts of our lives that want to be nurtured. The specific direction and content of the course will evolve alongside the group. By the end, we’ll each develop one major art piece to celebrate with good food, music and company. This workshop is a chance to create a greater sense of ease in life and art. It is designed for both artists and so-called ‘non-artists’. Participants should feel generally well, and be able to enter into self-reflection safely. "Your gentle facilitation put me at ease." 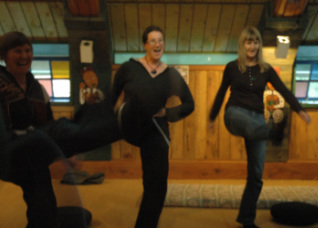 Workshops can be run at Shambhala Retreat Centre in Golden Bay or further afield. Please contact Jo for more information. Back to Workshops. Back to Transformative Art.